Page Street Publishing, 9781624145643, 192pp. Amazing Flavor, Complete Meals, One Pan! Sit back and let the oven do the work for you with this exciting collection of delicious, convenient meals. Just pop all the ingredients on a pan, slide it in the oven, and you’ve got dinner in no time! Plus, the counters stay clean and the sink doesn’t fill up with dishes. Grab your sheet pan, baking sheet, Dutch oven, or roasting pan and you’re halfway to dinner, even on a hectic weeknight. Throw together Spicy Blackened Chicken Legs with Sweet Potatoes and Broccoli for amazing favor in a flash. While Family-Style Herb and Garlic Roast Leg of Lamb is in the oven, you’re free to play a game with the kids or sit back with a glass of wine. Do you love hosting brunch, but hate scrambling eggs at the hot stove all morning? Pour yourself a cup of coffee and catch up with guests while the Make-Ahead Leek and Goat Cheese Strata heats up. Decadent fruit desserts and satisfying snacks round out your meals. Every dish is created with health in mind, without overdoing the salt and oil. With exciting combinations, and surprisingly quick prep, these recipes will transform the way you cook. 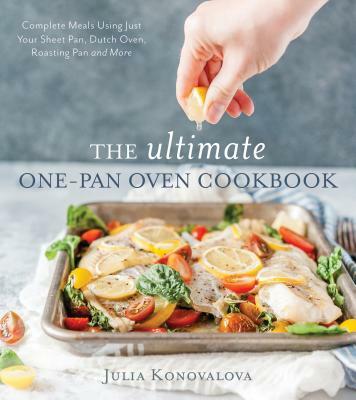 Julia Konovalova received her Bakery Arts Certificate from George Brown College and is the founder of the popular food blog Imagelicious. She lives in Toronto, Ontario.